When: Sat., April 20, 12-2 p.m. 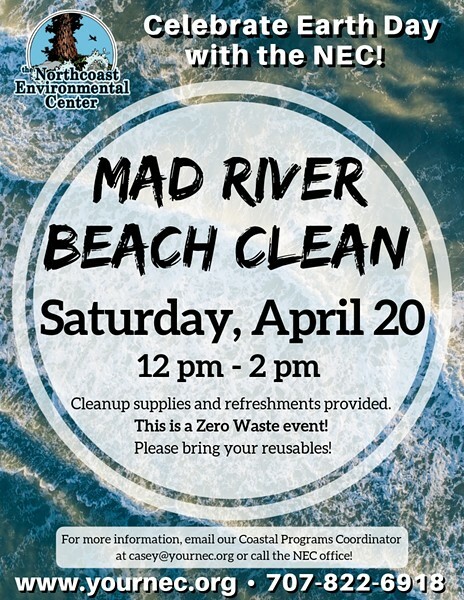 Celebrate Earth Day with the NEC by joining us for a beach clean at Mad River Beach on Saturday, April 20th from 12 pm- 2pm. All cleanup supplies will be provided for this Zero-Waste event as well as drinks and snacks. However, you’re welcome to bring your own reusables such as water bottles or thermoses for drinks, garden gloves, or your own beach clean bag. We hope to see you there. For more information, email our Coastal Programs Coordinator, Casey Cruikshank at casey@yournec.org or call our office at (707) 822-6918.